Back to our ThermoFax site. This is a Good buy at $2400 shipped! Includes Fedex shipping and Insurance!! Add to cart then begin checkout or keep shopping! The Details are in the PHOTOS & Description, Be a smart shopper. Cleaned, Serviced and Tested $350 value. This machine is very nice almost mint. Console and cover may show scratches and scuffs, see the 6 ACTUAL photos and video testing this machine below. Serviced Tested and Cleaned. This machine is in Great Condition for its age almost MINT, The ONLY Model Produced by 3M that may accept a 12" wide copy belt. I Buy and Sale Thermofax machines! I have serviced hundreds of Thermofax machines. 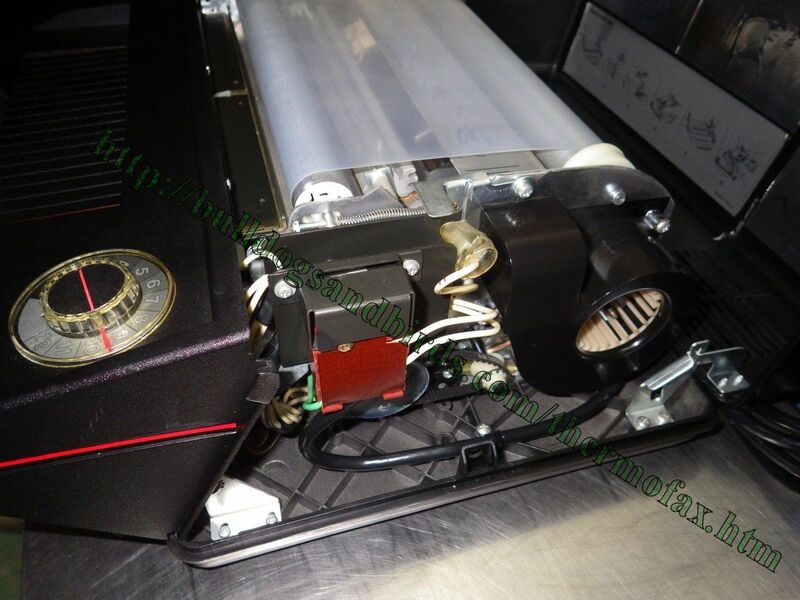 This machine has been Serviced, Tested and Cleaned by a DEALER. Cleaned not just wiped with a cloth. SEE ACTUAL PHOTOS (not a stock photo). TESTED, see photo--TWO ACTUAL STENCILS made with this machine, see video below. The dial pointing at number 9/10 position Note flash and thermal paper only going through machine (the machine had been tested a few times), your position may vary. Thermal paper has 4 layers. Pull out the thin brown wax layer (its trash), Now pick up 2 layers and place artwork against back layer face up and pass through machine. I will test the machine again the day of packing / shipping. 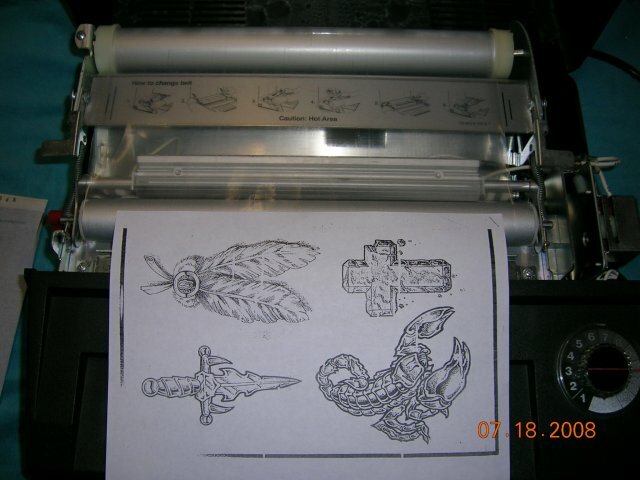 I will include 2 sheets of thermal paper and The sheet of FLASH to test it when it arrives. TIP: Regular belt cleaning, belt alignment and roller cleaning are a good idea! DON'T miss out, Buy it Now!! No Warranty for rollers, belt or the bulb. If bulb breaks in shipping buyer agrees to purchase a new one. Also Not responsible for any damage caused by dropping, one more time, No Returns. This machine is in great condition for its age! Note in the 3rd photo latches are down, red lever is down. This is the proper position--12" wide copy belt is centered and tight. 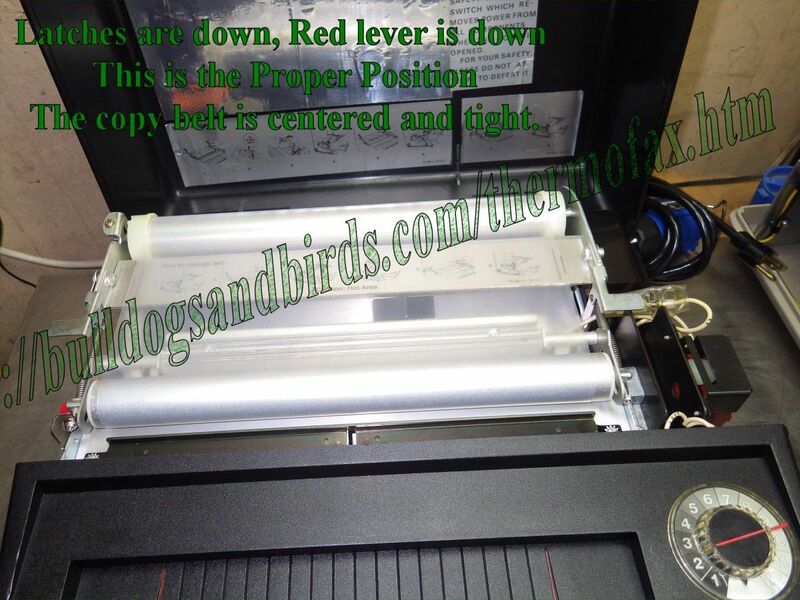 Note in the 4th photo latches are up, red lever is up, print roller, lamp and copy belt can be seen--copy belt is loose. 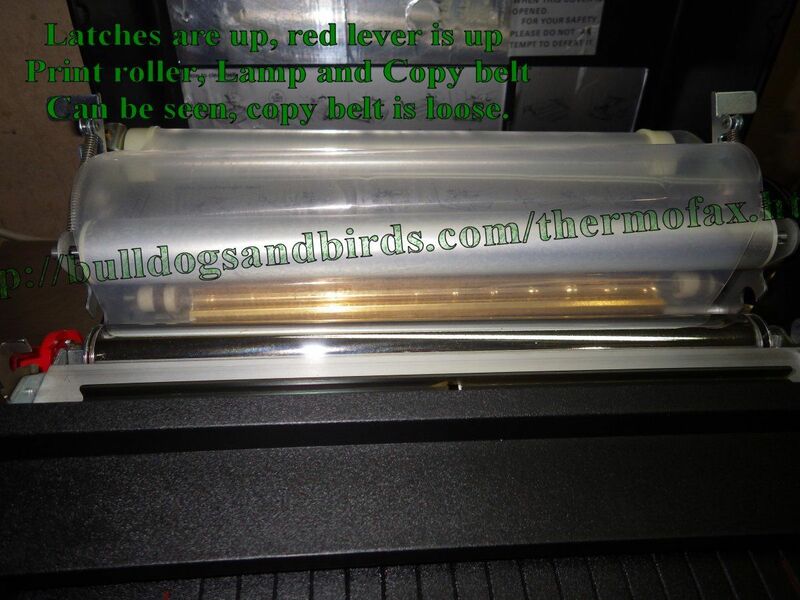 Will test the machine again the day of packing I will include 2 sheets of thermal paper for testing when you get it. NOTE: after purchase Owners manual for the 3M 4550 can be sent with email just ask. In below photo latches are down, red lever is down. This is the proper position--belt is centered and tight. Note photo below shows a 8.5" x 11" piece of paper sideways, you can see the belt on the 3M 4500 machines are 12" notice longer roller in the back for the 12" belt. (Compair to the next photo showing a 9" machine) Photo below is a sample 3m 4500 machine. 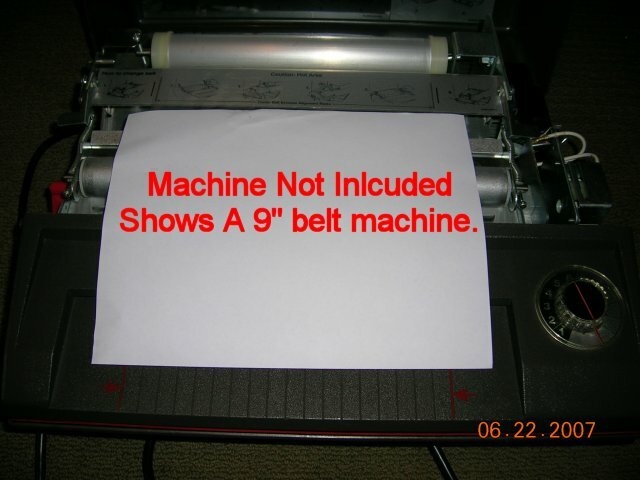 Note photo below shows a 8.5" x 11" piece of paper sideways, you can see the belt on the machine below is 9" (machine below not included only showing you a 9" belt machine). Movie testing machine below. Works like it should, (if the machine is hot) the machine fan will continue to run until cool -- with the light out. 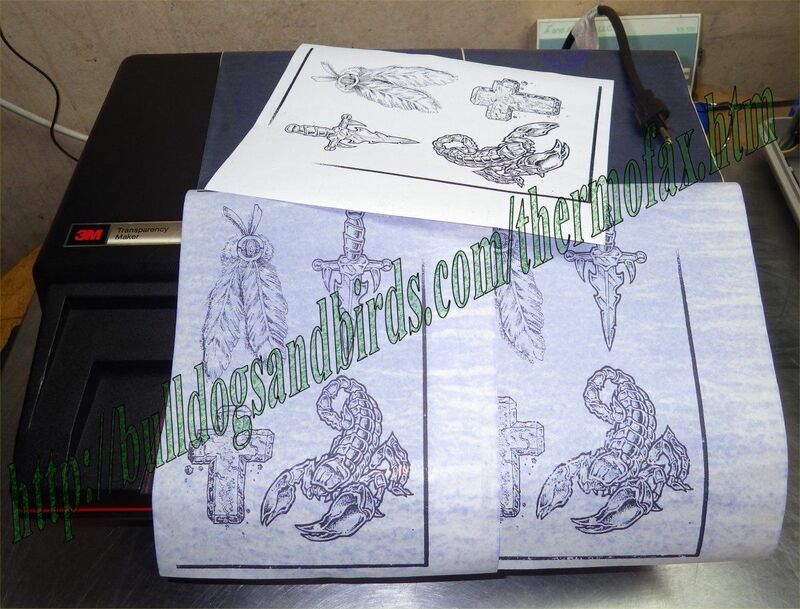 Note thermal paper only going through machine, you may need to adjust the dial for best stencil lines. link to Video below. Note flash and thermal paper only going through machine (the machine had been tested a few times), your dial position may vary. NOTE video is high quality you may need to watch it a couple times to stop the video lag. You have to copy and paste the below link into your browser. Buyer agrees to pays 95.00 Shipping, Handling & Insurance. I pack the machines very good. Machine will be Shipped FedEx--Home or Ground, include your phone number with payment. By purchasing buyer agrees to these terms before and after all other terms and conditions. Will only ship to continental US states. US Bidders ONLY. WE TRY TO DESCRIBE ALL OF OUR ITEMS AS ACCURATELY AS POSSIBLE. ALL OUR ITEMS ARE SOLD AS USED UNLESS STATED OTHERWISE. EVERYONES OPINION OF CONDITION IS DIFFERENT SO PLEASE TAKE A LOOK AT THE PICTURES AND DECIDE FOR YOURSELF. 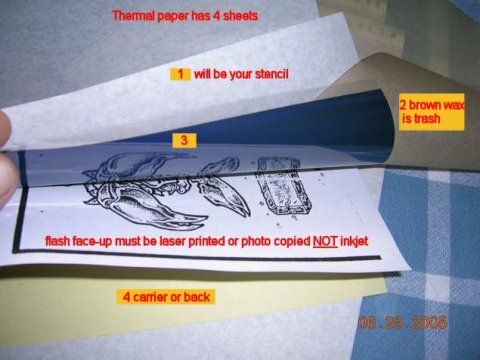 Flash must be laser printed or photo copied, NOT Ink jet or bubble jet. Always run machine at fastest setting possible(at least until you are familiar with your machine) to avoid burning clear carrier belt. Don't adjust speed when making stencil. It is important to feed the stencil paper straight into the machine to avoid jamming the machine with the paper. When you insert the stencil paper (the machine comes on) make sure the light is on before continuing to insert stencil paper. If the machine ever continues to run...and the light is on...to avoid melting the clear carrier belt--Quickly--unplug the machine open the cover and grasp back roller and turn the belt manually (it turns easiest turning the belt away from you). Practice turning the roller now so you know how. 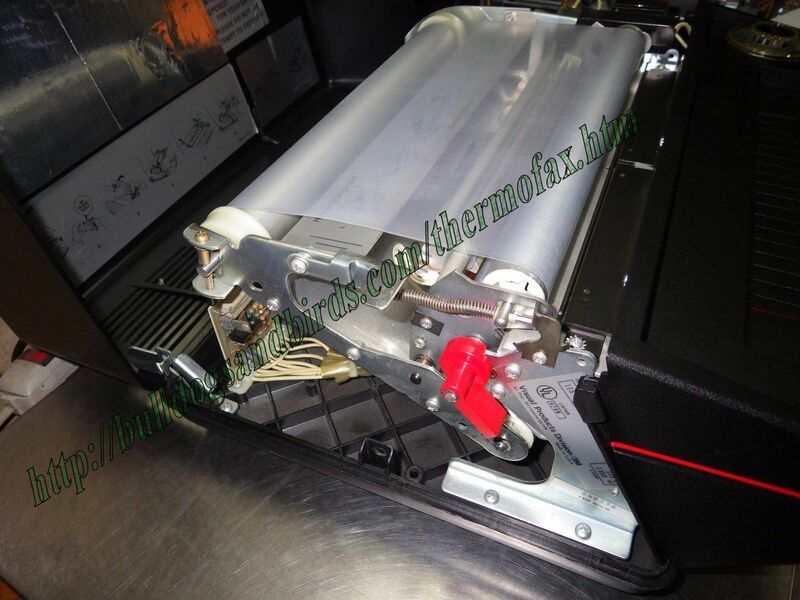 If you ever insert the thermal paper and the machine comes on, including the light but it does not take the paper...to avoid melting the clear carrier belt--Quickly--unplug the machine open the cover and grasp back roller and turn the belt manually (it turns easiest turning the belt away from you). Practice turning the roller now so you know how. 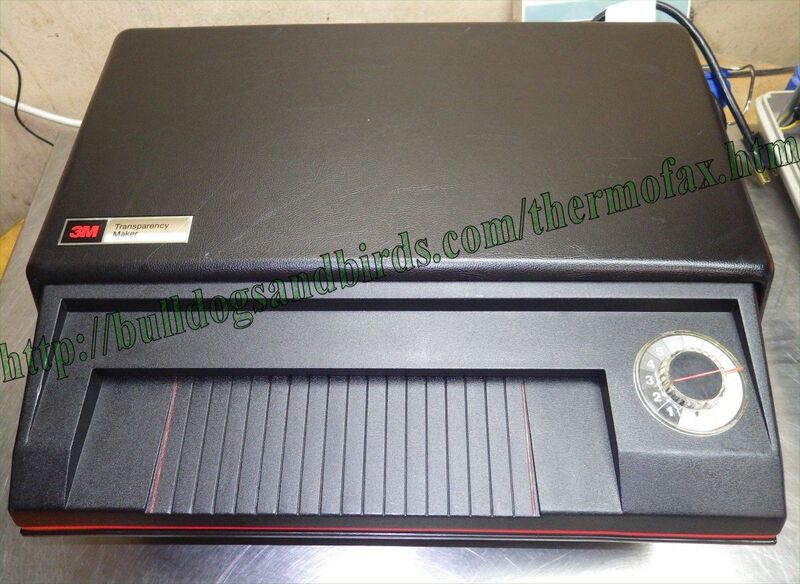 This machine uses Thermal paper, you must purchase yourself, no thermal paper included! Buyer agrees to pays 75.00 Shipping, Handling & Insurance. Machine will be Shipped FedEx Home Ground, include your phone number with payment, if a Business please say so. Payment Must be Made with PAYPAL. Important --> If the machine or any part of the unit is damaged it is up to the Buyer to file a Insurance claim (keep box and all packing material) I will help where needed. Thanks for looking! Email if You have any Question's! All sales Final, Sold as is. This is A VINTAGE ITEM and due to its age THIS ITEM IS BEING SOLD "AS IS" WITH NO RETURNS! My Recent Thermofax Reviews: Each line below represents a thermofax machine Buyers Review. All comments below are ONLY from thermofax machines. Please read them, I have worked hard and earned each one. You will be pleased too! I strive to deliver 5-star customer service, Please consider buying from me! Works and looks great! Thank You! Arrived today! Packaging was great! No damage, works great! Thank you very much! Wish there was someplace to leave you great feedback! Great Seller! A+ experience. Would definitly buy from again! Thanks so much! Awsome Machine works perfect, Thank you so much. This seller is awesome! Followed thru several times! Excellent condition! Thanks for EXCELLENT A+++ SERVICE!!! I could not have asked for better! Very responsive and very fast delivery! Great Seller! Very Caring about product. Shipped Great. Will buy from again! Wonderful. Thank you from the bottom of my heart. Can't say enough good! A++++++++item arrived safely. Thank you! Works amazingly, appreciated the test sheets, quick shipping! nice clean product!! works great!! packaged perfect and arrived in a few days!! good seller! thank you very well packed Fast Shipping on a great product! Received item promptly as well as tracking information and updates in transit Your service was great! Looking forward to doing business again. I was very pleased with my purchase and the quick shipping. Thankyou very much Super fast shipping, Product in great shape!!! A+++ Thanks! Best buying experience! Packed well, tested throughly, perfect all the way!! A++ Arrived promptly and very well packed for shipping. Looks great. Great! Thanks! Everything just as said! Very trustworthy seller! PROFESSIONAL!! !AND Fast!!!! Doesn't get any easier than this. Thanks Jim. seriously? In 10 years i have never used a better working Stencil machine! A+++ ABSOLUTLEY FANTASTIC amazing seller, greatest packing and communication, exact!!!! great communication and well packed shipping! great shipping,i needed it fast,and seller mailed out quickly/ awesome communication great packaging,very attentive. thank you! great seller fast shipping The thermofax was exactly as described and I received it within days of purchase Great communication fast shipping exclent product will buy again A+++++++++++++ FAST SHIPPING. WORKS GREAT. THANK YOU Great shopping experience INSANELY fast shipping GREAT seller! a+++++++++++++ Item was shipped promptly and was exactly as described. Great seller! thanks tons what i expected excellent transaction thank you! Thanks so much will do business again Great Seller!! fast shipping thanks A+++++++++++++++++++++++++++++++++++++ Awesome!!!!!!!!!! Worth every penny. great product,very quick delivery,A++++++++++ Fast shipping and a great product, just as described. A+A+A+ Delivered as stated, quick shipping, machine very clean and good condition Dude excellent sale, Very quick and with pride, Thanks again A+++++ was shipped the day after I paid for it and I received it n excellent condition Awesome Seller from begining to end,You Rock Man!!!!!!!!!!!!!!!!!!!!!!!!!!!!!!! VERY nice! So clean you could eat off of it FAST shipping will do business again very good transaction! A+ great seller,very honest.thank you Amazing transaction, Jim was very quick with shipping, and very kind. A+++++++++ very fast ship. Great e-bayer. Very highly reccomend. Great condition Great seller wish every transaction was this smooth! AAA+++++ Best Deal Thanks Arrived immediately! Works great! Awesome transaction Quick shipping, excellent product, good packing job. Look no further - this is the best seller right here!! All around excellent!!!!! fast shipping and nice doing business with you thanks good deal nice and as detailed would do buy again. fast shipping AAAA++++ Lightning fast delivery! perfect condition! Great Seller!!! thanks!! Go Buy it NOW. I will ship FAST.